SOUTH DEVON RAILWAY to mark ‘Thomas the Tank Engine’ author’s Centenary with exhibition of his life and work. The South Devon Railway will be commemorating the centenary of the birth of The Rev. W Awdry in June 2011. Best known as the creator of the ‘Thomas the Tank Engine’ children’s books and a cast of other popular railway characters, an exhibition about The Rev Awdry’s life and work is being held in the railway’s museum at Buckfastleigh station. Wilbert Awdry was born on 15 June 1911 in Ampfield, Hampshire. He was the son of a clergyman, and went on to study theology at St Peter’s Hall, Oxford. He spent three years teaching in Jerusalem, and went on to be the vicar at Emneth, near Wisbech in Cambridgeshire. 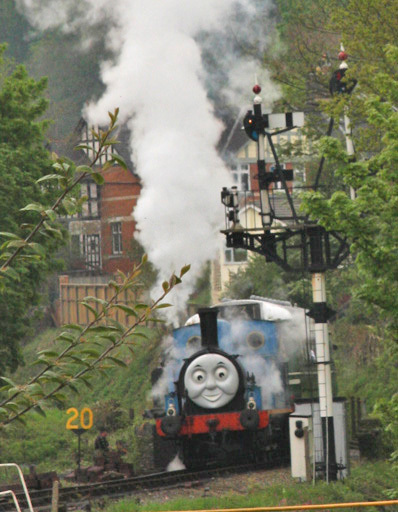 All of this pales into relative insignificance beside his main creation and world-wide phenomenon, ‘Thomas the Tank Engine’ But Thomas was not his first character – Edward the Blue Engine, James the Red Engine and Henry the Green Engine* had already appeared. His son Christopher, ill with measles, had been entertained by stories about Edward, and the volume “Three Railway Engines” appeared in 1945. Thomas made his first appearance in 1946 and, after James the Red Engine appeared in 1948, Wilbert Awdry wrote one book every year until 1972. He had retired in 1965. To mark the 100th anniversary of his birth and in conjunction with family members, the South Devon Railway is holding an exhibition about The Rev Awdry in its museum at Buckfastleigh station. It will feature photographs of Wilbert Awdry throughout his life, and show him as a young man, as the Vicar at Emneth, with his wife Margaret and studying a map of the fictitious island of Sodor, home of Thomas the Tank Engine. There will also be a number of other exhibits, including models and early editions of his books. Royal Mail is also introducing a set of special stamps from today (15 June) – the centenary of his birth. The South Devon Railway will be selling the special books of six commemorative first class stamps, which feature an image from the original series of books. In addition, it will stock a special first day cover, exclusive to the railway, which will be available from Expressway Models at Buckfastleigh station from Monday 20 June. Whilst the South Devon Railway’s exhibition was opened today on the date of his centenary, it will be launched officially on Monday 20 June at 14.30 by Veronica Chambers, one of The Rev Awdry’s daughters for whom the stories were written. The exhibition will then run for the rest of the season. * Thomas the Tank Engine, Edward the Blue Engine, James the Red Engine and Henry the Green Engine are copyright HIT Entertainment. Why not download our poster to help advertise this event ? Please note that the poster is in Adobe® "pdf" format, so you will need the Adobe® plug-in to read them. If you haven't got this yet then please click on the Adobe® icon above to download it.